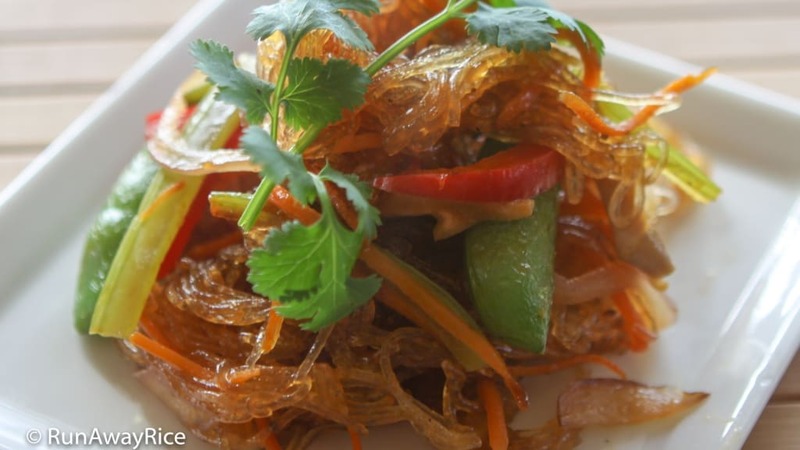 This tasty recipe for Cellophane Noodle Veggie Stir Fry (Bun Tau Xao) is gluten-free and loaded with healthy veggies and hearty noodles. In my recipe I use bean thread noodle which is made from mung beans. You can use other wheat-free noodles made from potato or tapioca starch as well. These noodles become sticky once they are hot so the trick is to not allow them to clump while cooking. Watch my video for a cooking tip. I love stir fry dishes for their versatility. You can add whatever flavor combinations you like and the cooking is fast. The keys to successful stir frying are cutting veggies to approximately the same size and cooking the vegetables in order of their density. Once you get the hang of it you’ll want to stir fry everything. Enjoy! Soak the bean thread noodle in hot water for 10 minutes or until they are soft. Drain well, shaking off any excess water. Prepare the stir fry sauce by combining the rice wine vinegar, gluten-free tamari or soy sauce, water, and Sriracha sauce in a measuring cup. Thinly slice all vegetables except for the sugar snap peas. Leave these whole. Heat a wok over Medium heat. When the wok is hot, add the sesame oil. Add the sugar snap peas and stir fry for 3-4 minutes until they start to soften. Add all vegetables except the mushrooms and stir fry for 2-3 minutes. Add the mushrooms and stir fry for 30 seconds. Add the bean thread noodles. Use your fingers to distribute and separate them as you add in the wok. Quickly stir everything together. Pour the stir fry sauce over the noodles. Add the water or broth. Stir fry for 3-4 minutes until noodles are translucent and soft. Be sure to keep the noodles evenly spread in the wok as you stir fry. Do not allow the noodles to clump. Sprinkle with freshly ground black pepper. Enjoy the Cellophane Noodle Veggie Stir Fry hot or cold.